I'm between project right now, so I decided to try hacking a colecovision game ! It seems I can use yellow from the arrow to brighten him up a little, will see. Also I tried to keep him centered, because Winky's movement was erratic especially in tight spaces ! Later I will change all monsters into various aliens, and maybe change the names of the rooms..
Edited by TIX, Sun Apr 14, 2019 1:58 AM. ..and a slimy alien creature running around ! a hack of venture ! Venture is one of my favourites on the system. Unfortunately the creature that comes at you when you spent more time in a room, has only two frames of animation..
Edited by TIX, Sun Apr 14, 2019 12:02 PM. Still looking for a name..
some of the slimy creatures, and the xenomorph that tracks you down..
Edited by TIX, Tue Apr 16, 2019 10:20 AM. Wow - you certainly have a talent for great animated sprites. These look awesome. Your sprites are great, and I like "Space Venture" just fine as a name. Maybe "Venture 2019" since we are living in the future. Do you have plans to change out the music, too? It would be neat to have little snippets of well known themes. The eyeball guy belongs in the room with moving walls, like the garbage masher in Star Wars. What form will the treasures take? Maybe "data tapes" and laser swords? too bad the main character doesn't have walking frames, not many things can be done with him.. but he is cute and I grow to love him ! The treasures, I had the idea to make them survivors that Robby (?) have to rescue, but I really cant draw 12 different people and I hate to make them all the same..
so I settled on making them items that will be useful in space, batteries, access cards, spacesuit, ... that kind of staff. Space Venture is pretty much fixed as a title, I'm searching a name for the little service robot with the big task ahead of him..
Music.. I wish unfortunately my experience in hacking is strictly in sprite editing..
hmmm the blob needs something more..
Edited by TIX, Thu Apr 18, 2019 2:53 PM. How about some teeth for the blob? Yeah something like that ! Also we need a spider/facehugger type thingy..
Might I suggest replacing in-level music with creepy ambient sounds against an otherwise silent setting? Think of how creepy certain sounds were when playing Atari 2600 games, and they rarely had music. Think of the sound ET's neck makes; think of the pulsing, humming buzz in Yars' Revenge; think of the enemy robots' lasers in Berzerk; think of pretty much the entire sound library in China Syndrome. Experimenting with a MIDI keyboard and square/triangle wave effects will yield surprisingly effective results. As for the little 3-4 second tunes in between? Look to games like Metroid (NES) or Gorf for inspiration. I love your sprites, by the way. This looks like it'll be a fun hack. On another subject, do you (anyone) know how to edit the text in the game ?? I'm working with hack-o-matic and I don't see anything editable !?!? How to change the sprites at the first place? It's easy to view the sprites by looking at, and decoding (for want of a better word), the value of the bytes in the games binary rom file. I did this to hack Matt Patrol into Moon Patrol using Excel. However, hacking anything other than graphics which are easy to identify, is very difficult. 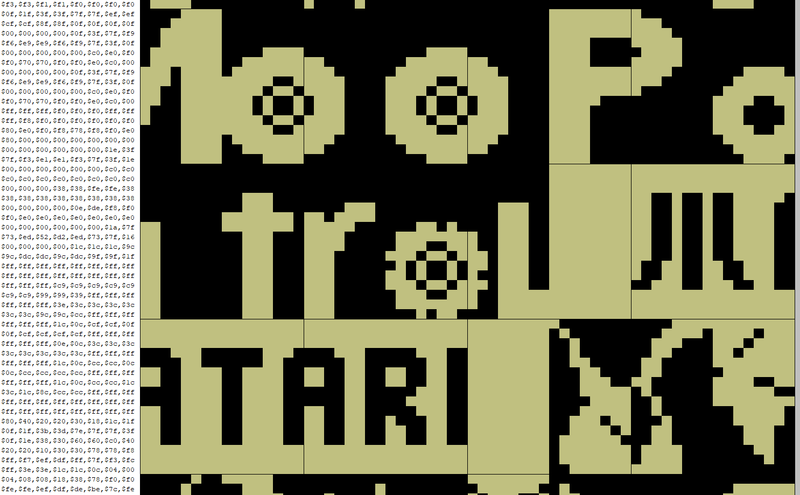 For example, the various non-sprite colour changes I implemented between Matt Patrol and Moon Patrol was achieved completely through trial and error. I have no clue how anyone could hack the music - I'd imagine if it was possible that it would be an enormous amount of work. You'd likely be much better off disassembling the rom, and reprogramming it, rather than trying to hack the binary. 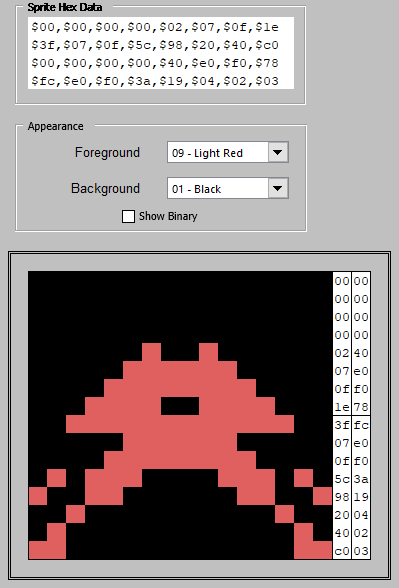 By way of examples for the graphics/sprites, the first image attached is how a sprite is assembled from the hex value of individual bytes, while the second image shows reversing that process to visualise the graphics found in the Moon Patrol binary rom "decoded" from the hex value of individual bytes. or something like that !! oh and a toothy blob attached you were right, he was too cute ! Edited by TIX, Yesterday, 10:36 AM. The problem you're going to have is that you can't change the length of each text piece when simply hacking the binary. If you do want to change their length, e.g. going from "VENTURE" to "SPACE VENTURE" then you're going to have to disassemble the binary, edit it, and then reassemble. That said, venture is actually 9 characters long as it includes the "TM" so the title could be hacked to something with 9 characters. Spider, could be hacked to Hugger (looks like SPIDER has a few spaces after it so you might be able to name the rooms with up to 8 characters). Yes I understand ! thanks for the explanation.